We left Wednesday afternoon, June 28 about 4:00 in the afternoon. 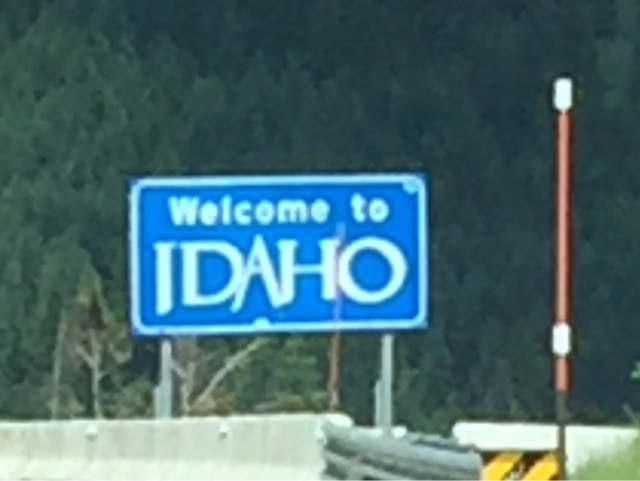 First we drove from Washington into Idaho. A short hour or so later, at the top of Lookout Pass, we crossed into Montana. Montana and Idaho are so beautiful. 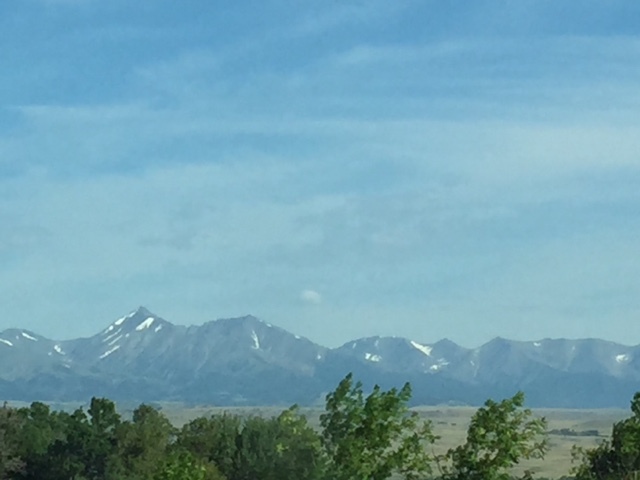 Lots of snow is still on the mountains, even with the heat we've had. We spent the night at the bottom of Homestake Pass in Whitehall, MT. Early Thursday we were on the road again and drove 12 1/2 hours that day. 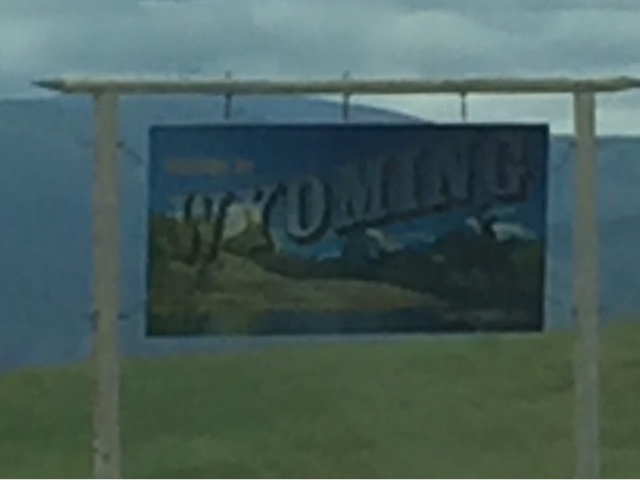 After Montana's 550 miles, we entered Wyoming and enjoyed views of the Bighorn Mountains as we made our way southeast. 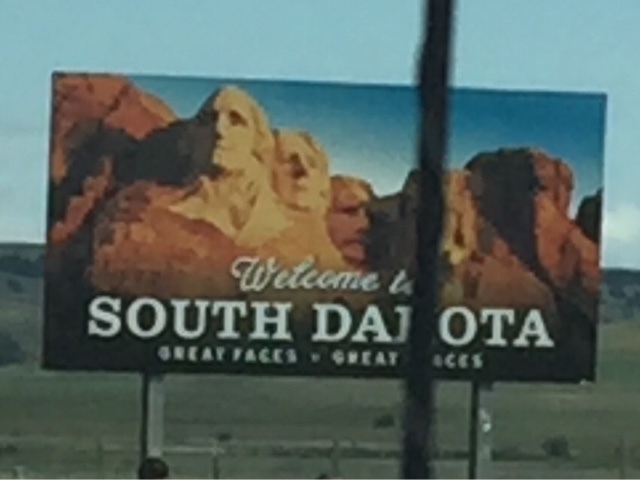 After just a few hours and 200 or so miles, we crossed into South Dakota. Although we drove through Sturgis, (where the motorcycle rally is held every year), Spearfish and Rapid City, there was no stopping us. We were on a mission to see our girls. Thursday night we stayed in Mitchell, SD, home of the famous "Corn Palace." 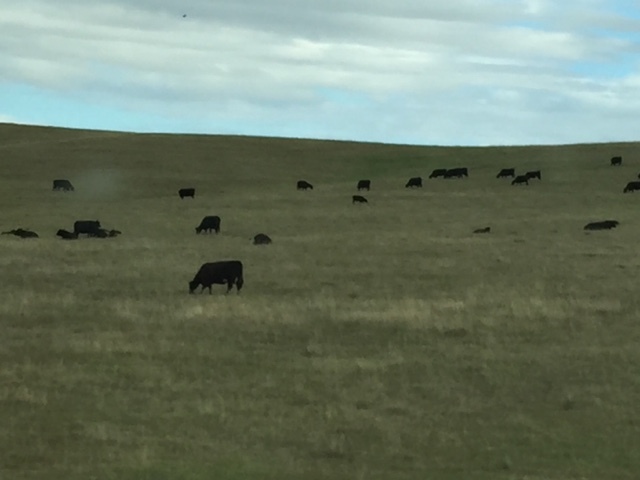 We knew we were back in the plains states because of the endless vistas of prairie and cows! Friday morning we were up bright and early and finished the South Dakota portion of the drive and entered Iowa! We were getting close! 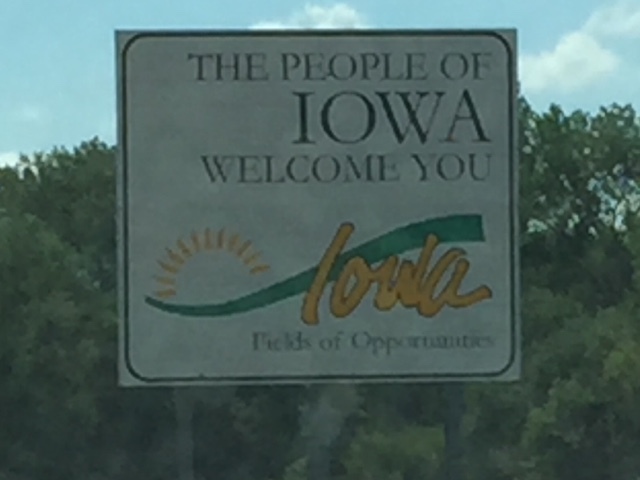 It's only about 1 1/2 to 2 hours to Omaha once you enter Iowa. We made it. We crossed the Mormon Bridge into north Omaha and Grandma's, (Dennis' Mom's), house is only about 5 minutes from here. Finally, after 23 1/2 hours of driving we were here. Mandy and Brad have bought a house in Omaha and are waiting for the closing late next week. Meanwhile, Grandma is enjoying having everyone there with her. This was our prize when we arrived. She was thrilled with the baby sweater, hat, socks and blanket I knitted for her baby on the drive. It was SO good to get hugs from her and her Mama. Leaving on Saturday morning wasn't nearly as much fun. 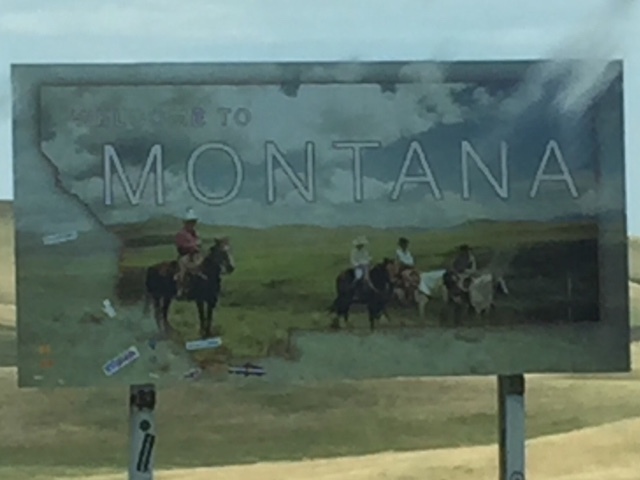 We drove from Omaha to Billings, MT on Saturday and the rest of the way yesterday. We're both exhausted but it was worth it. My back did fine on the drive. We did stop often at rest areas for only five minutes, but enough to stretch muscles. I have lots to do today and plan to head to the lake this afternoon for a day or two. I'll try to catch up with everyone soon. I'll write more in a day or so to tell you about the fun things we did while in Omaha, but I wanted to thank you all for your prayers for my back while traveling. I appreciate each and every one of them. I'm already planning my next trip there in a couple of months. This time I'll try flying! I've been thinking about you. I know you were in 7th heaven being with Piper and the family.. How special.... Glad you had such a wonderful trip... You drove through some beautiful areas of our country... Glad your back did fine..... Blessings to you. 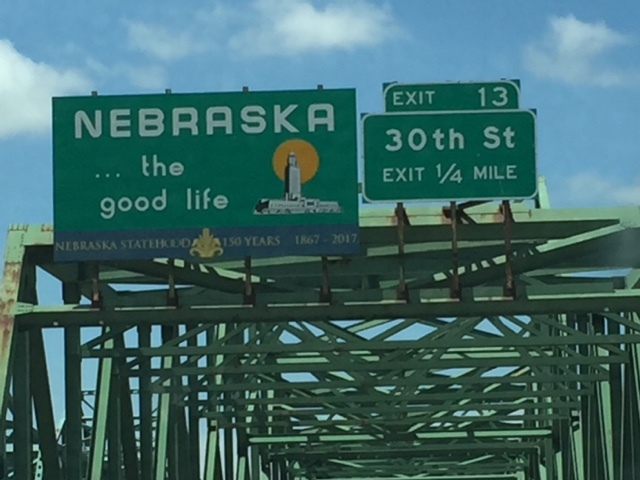 I LOVE that you took all the pictures of the state signs. I do that too!!! The little Miss looks more than happy with her surprises. I know it was hard to leave her. I am thrilled to hear you did so well with such a long drive. Our prayers were answered. Looking forward to hearing all about your adventures. Take care. 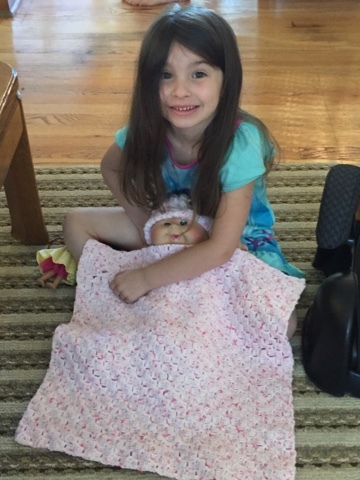 Piper's smile is precious, and I can tell she love the things you made for her baby. I'm glad your trip went well and that your back didn't give you any trouble! Welcome home. I was wondering where you were as I missed your last post, as I had a busy week. I found that post...oh good, on a trip. Glad it went well with you and your adorable granddaughter loved to pieces by you, for sure! The plains states are interesting. I've been there some time ago. I had a friend that lived in Omaha but she's not there any more. Take care and rest well. Glad your back didn't give you much grief! Hugs and blessings! It's hard when family is so far away, but at least we have good cars, good roads and airplanes when we want them . . . I'm so happy that your back was fine for your trip. Get some rest at the lake if you can. I'm so glad you had a good trip, Betsy. It sounds like a beautiful drive to Omaha. I've never been through that part of the country at all, so I would really enjoy driving through someday. My husband comes from northern Colorado near the borders of Nebraska and Wyoming; his parents no longer live there so I've only been in that area a couple of times and I'd enjoy seeing them again. I hope you have a good rest at the lake, enjoy yourselves! Welcome home. Beautiful Piper has sure grown!!!! Rest up! Praise God dear sweet sis, so very grateful that you teavellled so welll, all that lonnnngg way!!! And your girls hugs and smiles made every mile worth it. Praying for you to unwind from trip and God willing fly next time. Pray so. I'm not well, with winter bugs floating around Downunder, so not blogged much except essential DT posts. Glad you had such a good trip and no back problems and that you got to see your family. I am confused though as Iowa is east of Nebraska and you were coming from the west? Wasn't that out of your way or were you right along the border? I know I used to have IBM meetings in Omaha and if I remember it is right across the border from the western edge of Iowa. Anyway, just curious as I was trying to follow your route. Glad you are both home safe and sound. I guess they are 'closer' now but that's still a long, long drive. We took I-29 from I-90 at Sioux Falls, SdD. It does go right along the NE/IA border. Yes, I guess closer is relative isn't it?